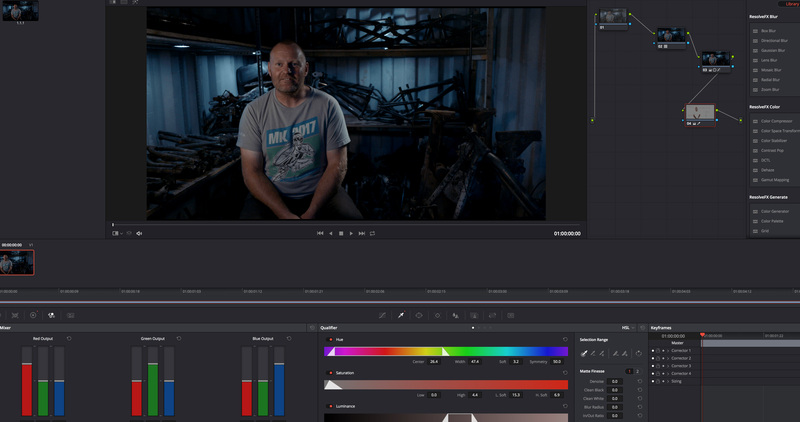 Anatomy of lighting an interview. In the production of the doc Rom Boys I recently came across a great story from an old School BMX legend Rob Steele af Radii Ramps(www.radiiramps.co.uk) that I felt played a really important part of the recent history of the park. 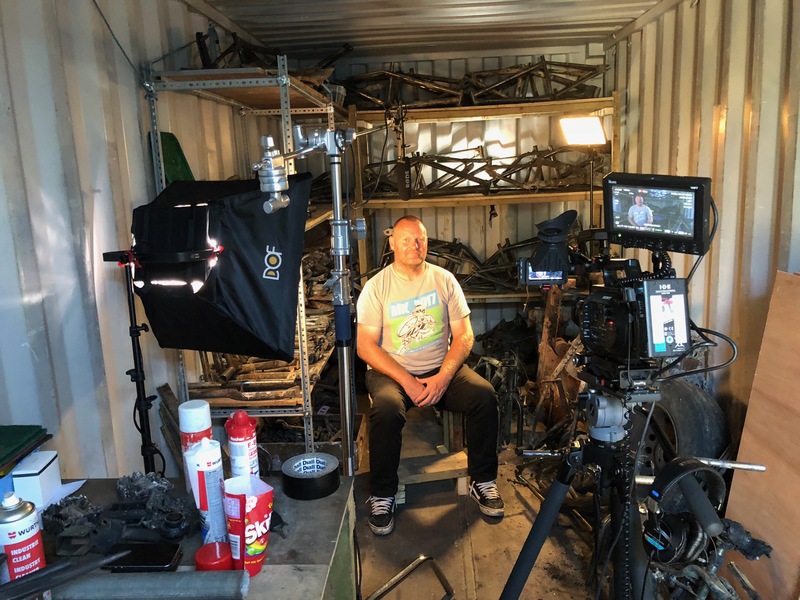 To really get this segment across I needed to shoot this in his storage container as the backdrop and contents were vital to the story he was telling. This was difficult, due to the space, but also great from a creative perspective as it enabled me to really play around with the lighting to shape the effect and mood I was after. Most of the interviews I end up shooting are dry and corporate, in featureless offices with big windows that are impossible to control the light spill. This shoot was the opposite, a completely black, confined environment - great for shaping the light but difficult to get all the lighting I wanted into the space. So heres my approach on the space and the results. Showing the contents of the container was key but I felt shouldn't overpower the subject, but also I didn't want Rob to be overly lit or too moody. His story was dramatic, for sure, but also optimistic and positive so a crime scene interview style (very harsh shadows) I felt wasn't right, so I wanted the traditional 3 point interview but I was very limited by space and also everything in the container was absolutely filthy from fire damage, so manoeuvring around also proved very tricky. I didn't want too much fill as I wanted the shadows to help create the atmosphere, so I ditched a fill light but kept the container door slightly ajar to bounce a tiny amount of light off the right hand wall of the container. In hindsight the nose shadow is probably a bit too harsh but as you can see from the pic below space was really tight. 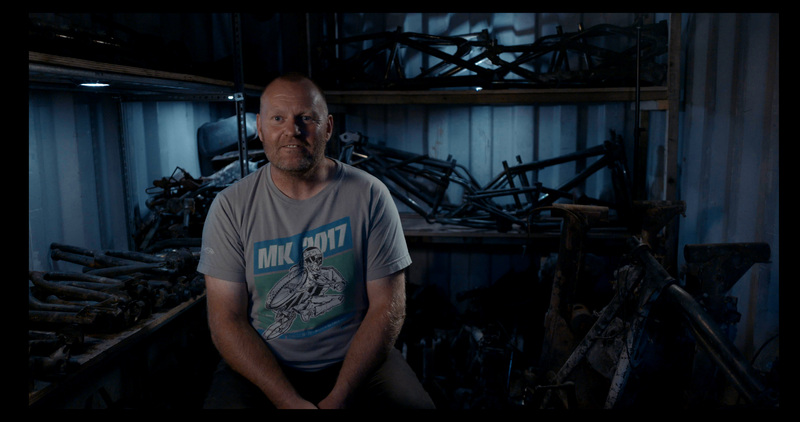 In terms of colour I wanted to contrast Rob with the bicycle frames, I felt Rob should be warm whilst the frames cold and blue to really create that contrast and separation and with enough head room so I could if necessary crop in for closeups (I'm shooting in full DCI 4K). 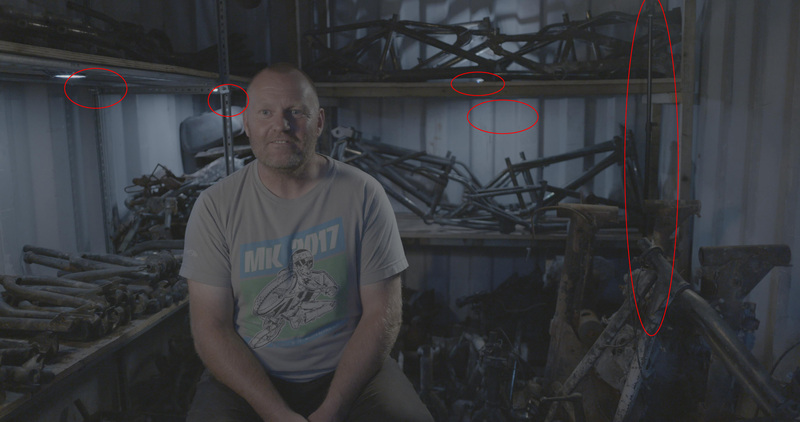 For this I used my Aputure LS1 - Daylight LED but with a Lee Filters CTO gel and really closed the barn doors down to focus the light and pumped it to 100% . I placed it quite close to the subject to keep it from spilling on the background and put on a DOF Diffusion box and egg crate to aim the focus even more (you can see from the picture there's still some spill coming out of the back of the light that I didn't really pay too much attention to) *note to self - tape this up next time. I also placed a hair light with CTO to the right to separate Rob from the background. I knew the stand would be in the frame with my 18mm lens but if I moved it in front of the shelf post and kept it in the shadows,I thought that unless you were really looking for it with the amount random stuff in the shot you wouldn't really see it and if it was that obvious I could easily Photoshop it out as nothing in the frame was moving. Sure enough unless you are really looking for it it blends into the background. To highlight the bikes I had 4 Aputure mini Amaran M9 LED's. I kept these at daylight to give a contrast to the key lights and give a blue background. Three placed with gaffer tape pointing down on the frames and one pointing up to give a harsh upward shadow highlighting the shape of the frames. Heres the Log composition. Shot on an FS7 in SLOG3. One thing I completely missed was the bottle of drink on the shelf in the top left. I was more concentrated on the lighting and framing that I completely missed this. 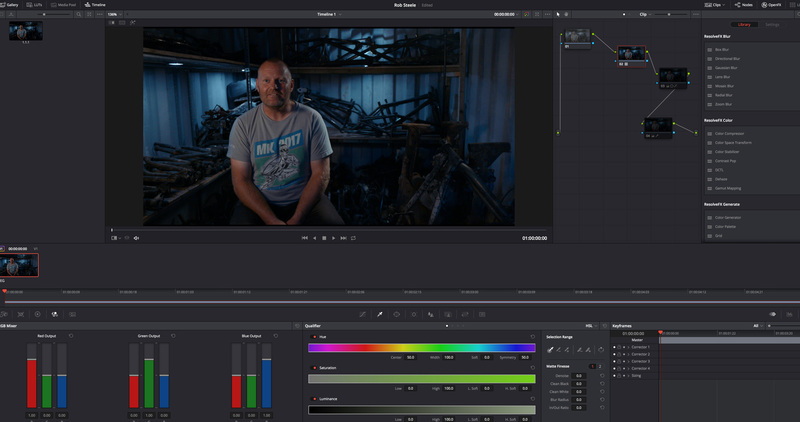 I've got a LUT developed for the Rom Boys doc and so first step was dropping that in Davinci on the footage. This gave me the look I wanted but I felt Robs skin was too saturated. So a quick skin qualifier to reduce saturation. Final version with light stand removed, visible M9's removed, curves adjusted.